DEMOCRATIC Korean leader Kim Jong Un held talks with US president Donald Trump in Singapore this week that many hope will pave the way to lasting peace on the Korean peninsula. Chairman Kim met President Trump in a historic summit in Singapore on Tuesday. The meeting, at the Capella Hotel on Singapore’s Sentosa Island on 12th June, ended with the signing of a joint statement and an agreement for further face-to-face meetings in Washington and Pyongyang in the future. DR AQEL TAQAZ, the Vice Chair of the World Peace Council, spoke to a packed room at the Palestinian Museum and Cultural Centre in Bristol last Monday about “The Struggle for Palestine” and the serious difficulties and uncertainties in the region which have been exacerbated by recent American decisions. 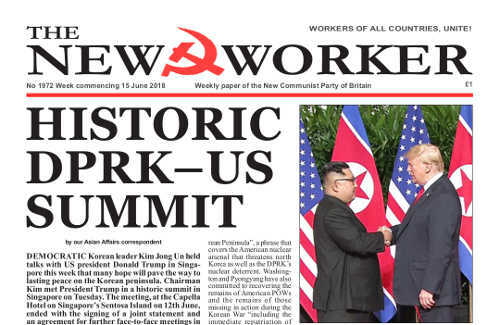 DEMOCRATIC Korean leader Kim Jong Un took a giant step towards ending the tension on the Korean peninsula when he met Donald Trump, the leader of US imperialism this week. By all accounts Chairman Kim and President Trump made considerable progress at their ground-breaking talks in Singapore this week.